Facilitate the movement, the sliding between 2 mechanical parts in movement. Avoid seizure even if used on heavy loads. Minimize and avoid premature wear on equipment. Protect mechanical parts against oxidation and corrosion. Avoid overheating, evacuate the calories generated by friction. BARDAHL principle : Bardahl lubricants are formuled from "polar active" components. These components behave like micro-magnets. They are attracted by metal surfaces on which they adhere to form an extremely resistant lubricating film. 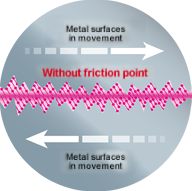 This molecular film prevents damage generated by the "rough surfaces" on metal parts which cause early wear and seizure. The "friction meter", our mobile demo machine, allows us to demonstrate this molecular lubricating film and to illustrate the protection offered to machined surfaces. Metal parts come into contact with each other through the 'rough peaks' on their surfaces and it's these peaks that bear all the load and pressure which in turn causes undue wear and eventual seizure. The reduction of wear and seizure is due to the active agents lubricating film which avoids contact between 'peaks'.